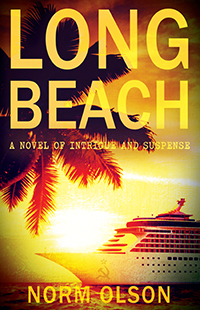 Norm Olson’s “Long Beach: A Novel of Intrigue and Suspense.” Marc Ryder, an agent of the Defense Foreign Liaison, is thrust into the middle of an international drug ring and becomes the target of a formidable assassin. With his marriage is on the rocks, his job leads him into the USSR and a liaison with a beautiful Afghan woman and a Chechen smuggler. A desperate, hired, female assassin makes it her mission to terminate Ryder. Dead bodies are stacking up as an old fashioned shoot out takes place in Puerto Vallarta. Murder and betrayal run rampant in this suspense thriller.